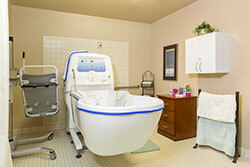 In addition to short-term rehabilitation, we provide Long Term care. Residents can receive both private and semi-private accommodations and transportation to and from most medical appointments. Residents enjoy daily meals in any of our three beautiful dining rooms and loved ones are encouraged to share a meal when possible. We also offer free wireless Internet access to our residents and their guests to keep friends and family better connected. We ensure our patients always have an opportunity for social involvement by offering them a large variety of social events and activities both in-house and in the community. In addition to group activities, we offer social opportunities based on resident’s individual wishes. 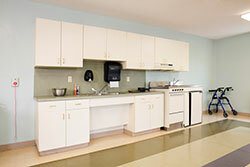 Residents who receive respite care are welcome to the same services provided to our full-time residents, including a private or semi-private room, daily housekeeping and laundry services, daily activities, and daily meals including continental breakfast and snacks. Our team of caregivers are dedicated to making sure your loved one is cared for in a homelike, friendly environment.